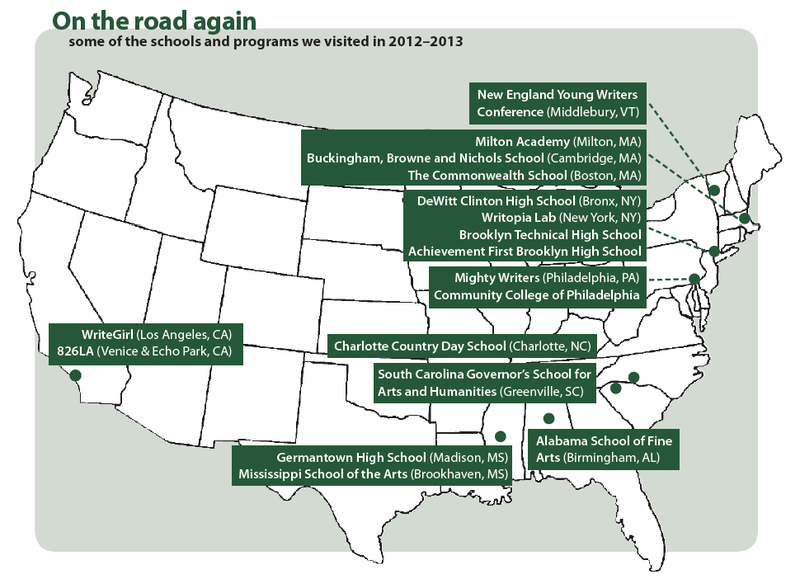 During the Fall of 2013, Jamie-Lee has visited (and revisited) the South Carolina Governor's School for Arts and Humanities, Francis Parker School (San Diego, CA), the Orange County School of the Arts (Santa Ana, CA), Bonita Vista High School (Chula Vista, CA), the San Diego School of Creative and Performing Arts, Writopia Lab (New York City), Girls Write Now (New York City), and St. Andrew's School (Middletown, DE). In October 2013, the KWH recruitment team partnered with Penn Admissions to host Ivy In Your Backyard, a day-long college prep workshop for Philadelphia public and parochial high school students. We now offer a 10-day-long online book group for prospective students! The next group will run from June 23-July 2, 2014. To sign up, write to whbook@writing.upenn.edu. For years, we at the Kelly Writers House have stewarded prospective Penn students through the college application process, recruiting strong writers the way a swim coach recruits a promising backstroker. We are especially interested in reaching out to potential applicants who don’t know the strength of the arts at Penn and to those who think Penn is beyond their reach. 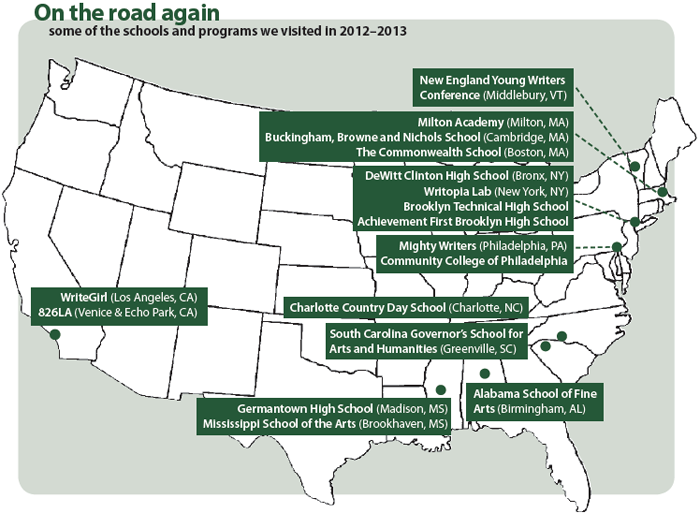 To support these efforts, we have hired a recruiter and mentor – our own Jamie-Lee Josselyn (C’05) – who visits schools, writing programs, English teachers, college fairs, summer writing institutes, and after-school arts projects for talented youth around the country in search of great writers. Our Student Recruitment Fund helps defray the cost of outreach, ensuring that our recruitment is as far-reaching as possible. We are grateful to Joan Kim (C’97, G’97, WEV’99) for making the inaugural gift to this much-needed fund. To Make a Gift to Our Student Recruitment Fund, Please Go Here. 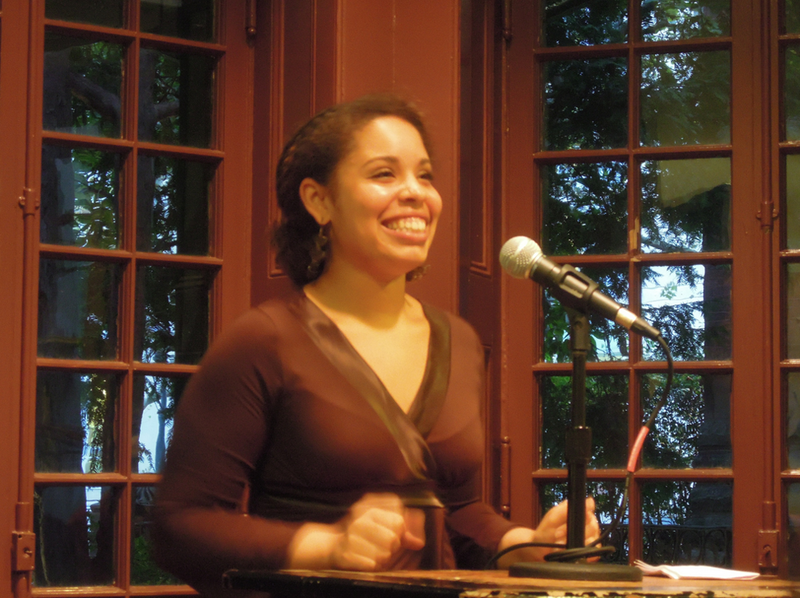 "When our students met with Jamie-Lee and learned about the Writers House's extraordinary programs and resources, it helped bring the dream of going to college closer to reality. 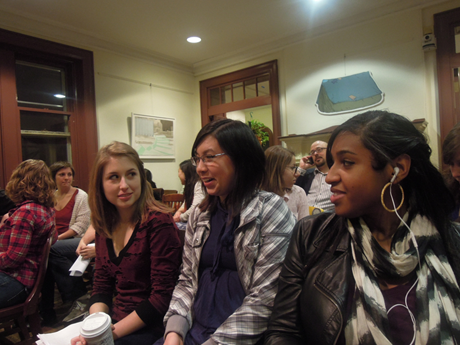 They could see themselves there, writing, learning, and contributing to the Penn community. It's been wonderful to connect with not just a program, but also an admissions process, that values our students' creative achievements and understands their challenges." "Do you know what a surprise it was to hear from my college counselor that the University of Pennsylvania, of all places, was recruiting me for writing, of all things? My English teacher and I are still in shock." "Just a few days after I toured Penn, a creative writing student emailed me to give me more information. Kelly Writers House students and faculty continued to reach out to me over the next few months. While some of my friends struggled with their college search, I knew right away that Penn was the right school for me. Everyone at the Kelly Writers House was so willing to answer my questions and stay in touch with me—I immediately felt a sense of community." Would you like to know more about our recruitment process? If you or someone you know is an excellent high school writer, you can learn more about the opportunities available for prospective students. Also, feel free to be in touch with Jamie-Lee Josselyn, our Associate Director for Recruitment, if you'd like more information. 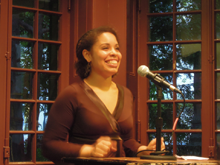 Jamie-Lee meets regularly with young writers: talented high school writers who want to find out about opportunities at Penn, talented creative writing students at Penn who want to get more involved in Writers House activities, and students in her popular course on memoir writing. Read an interview with Jamie-Lee about her recruitment work here. 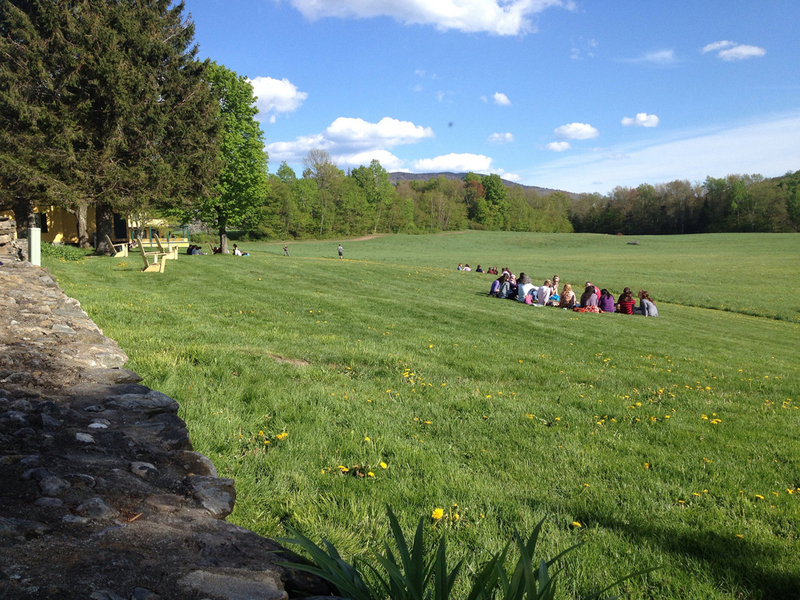 Students get involved at Writers House in all kinds of ways -- as planners, performers, chefs, and creative thinkers. 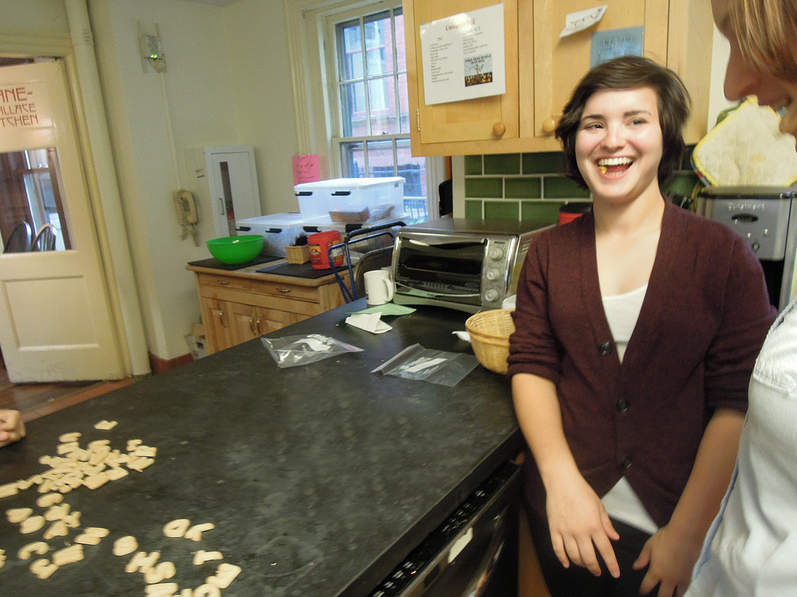 Here's Victoria Ford (C'15, above) performing her work for our annual Caroline Rothstein Oral Poetry Program and Lauren Shapiro (C'16, below) hanging out in the Kane-Wallace kitchen.